During the 1990s, a new form of entertainment began: Live Action Role Playing or LARP and it has become popular in mid-Michigan, including Meridian Township. LARPing is a live embodiment of a table-top role playing game, where people become their desired characters. LARPing takes place in a fantasy world where players can accomplish numerous tasks and quests. “The LARP does involve people being in full costume, acting out their characters,” said Jeremy Plesco, founder and head storyteller of the Lansing Game of Thrones Vampire LARP. Plesco has participated in a number of fantasy and combat based LARPs. 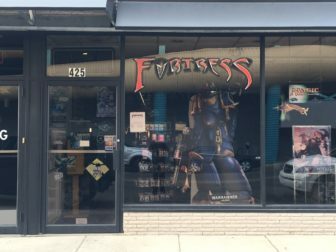 Plesco is also the Owner of East Lansing’s Fortress Game and Comics Inc., where the group meets biweekly in order to conduct their gameplay. Being that the Lansing Game of Thrones Vampire LARP is the only LARP of its kind in the mid-Michigan area, Plesco finds joy out of bringing members from different communities together multiple times a month in order to share a common interest. “I think everyone has some misconceptions about what LARPing is,” he said. Members travel from places such as Meridian Township, Grand Rapids and Saginaw, in order to participate in the LARP. The group currently has 25 active members not including staff. Based in the medieval continent of Westeros, the game takes place in the capital of the Crown Lands, Kings Landing, which resides in one of the seven kingdoms. While in the early stages of development, players currently contend for everything from court positioning to carrying out assassinations in order to get advantages over opposing players. As the story plot is further developed, players can become eliminated from the game and will have to re-enter the game as a new character during the next game session if they wish to continue playing. The LARP involves characters physically acting out their social interactions in full costume. Joel Ferris, resident of Lansing, was originally nervous to try a LARP due to some videos he had seen online. However, after overcoming his uneasiness, he became quite fond of to the game. Ferris accredits his success in the game to his previous political and film background. He has been a member since 2013 and believes that the family friendly community that LARPing has to offer is a pleasing addition to Meridian Township. Other members of the LARP community such as Don Dean, have been LARPing for nearly 20 years. Dean continues to meet lifelong friends and further develop comradery through the intricate and thought provoking experiences that the Lansing Game of Thrones Vampire LARP supplies. “Gaming has always been a great outlet for me to explore my creative and competitive sides, and it’s where I met the love of my life,” Dean said. The timeline of the Lansing Game of Thrones Vampire LARP is set 100 years before the Game of Thrones’ television and book series, during the targaryen dynasty. This allows the story tellers to have access to years of developmental routes while providing a more historical feel. The group plans on exploring new avenues of both plot lines and characters. Aside from their biweekly meetings at Fortress Game and Comics Inc., the group retains an active Facebook page where they maintain and build relationships within the LARPing community.